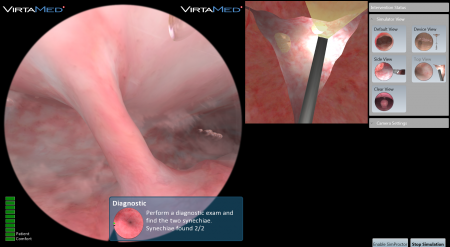 The VirtaMed HystSim™ offers highly realistic hysteroscopy training for the practice of diagnostic and therapeutic procedures. Learners are able to train with real instruments, including a hysteroscope, loop electrode, grasper, scissors and roller ball, while gaining live performance feedback. 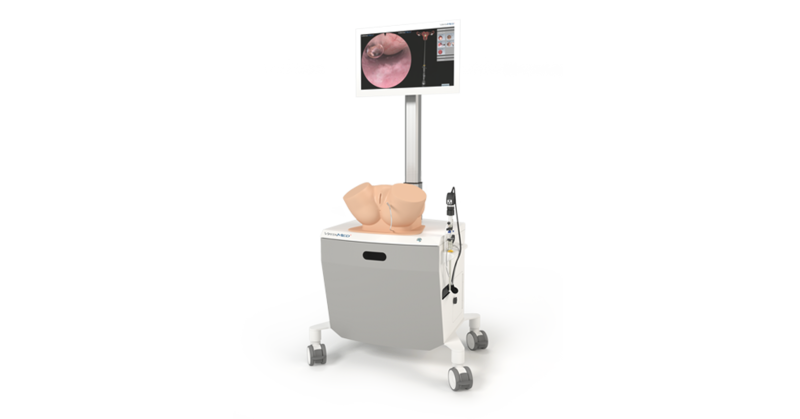 With photorealistic graphics and more than 50 pathologies, both trainees and practicing endoscopists can gain experience with a variety of cases in a risk-free environment. 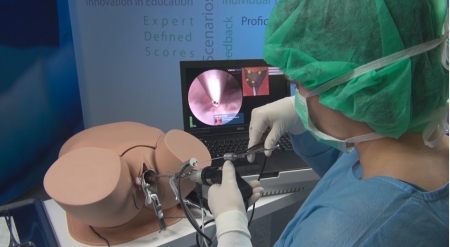 The VirtaMed HystSim™ learning modules cover essential skills, diagnostic and therapeutic hysteroscopy and challenging interventions, such as multiple polyps or myomas. The essential skills module is a complete curriculum for integration of hysteroscopy training into Ob/Gyn residency programs. Using a hysteroscope and standard grasper handle, learners can practice aligning the scope, camera handling, establishing clear viewing and safe navigation, taking a biopsy and polyp removal. The hysteroscopy modules offer 32 patient cases of varying difficulty, including polypectomy, myomectomy, and endometrial ablation procedures. Practitioners can prepare for more challenging interventions such as a fundal septum, multiple fibroids and intensive bleeding. The VirtaMed PelvicSim™ can be combined within the HystSim™ pelvic model for more training options. PelvicSim™ allows trainees to practice uterine sounding and intrauterine device (IUD) placement with real devices and instruments. Learners use a speculum to manipulate the version and flexion of the uterus with a tenaculum forceps. The IUD cases allow physicians to practice placement of the Mirena®, Skyla/Jaydess® or ParaGard® in anteverted or retroverted uteri.